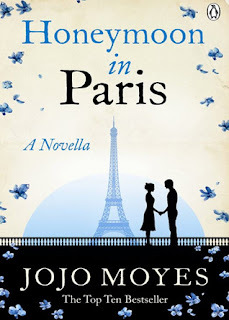 For fans of Jojo Moyes' Me Before You, who can't wait for her new novel The Girl You Left Behind - out in September - here is an irresistible ebook-only prequel novella, Honeymoon in Paris. At the heart of Jojo Moyes' heartbreaking new novel, The Girl You Left Behind, are two haunting love stories - that of Sophie and Edouard Lefevre in France during the First World War, and, nearly a century later, Liv Halston and her husband David. This enthralling self-contained story will have you falling in love with Liv and Sophie, and with Paris then and now, and it is the perfect appetizer for the The Girl You Left Behind, a spellbinding story of love, devotion and passion in the hardest of times. As with everything that I have read from Jojo Moyes, this novella was immensely enjoyable. As anyone who knows me is probably aware, I am not that big of a fan of any kind of historical novel or story. This one isn't completely set in the past, but I think that even if it had been, I would have enjoyed it anyway. Moyes just has such a gift of telling a lyrical tale that is completely enthralling and captivating yet simple and just plain good. I found myself loving the characters immediately without having to get to know them for a long time which as it was a novella, this was an important detail. I loved how I could identify with them and felt in my heart that I would be feeling and acting the same exact way. There isn't much more than I can say without giving too much away but anyone who loves a good and complete story, this will not disappoint!